Dare to be the Last Man Running? 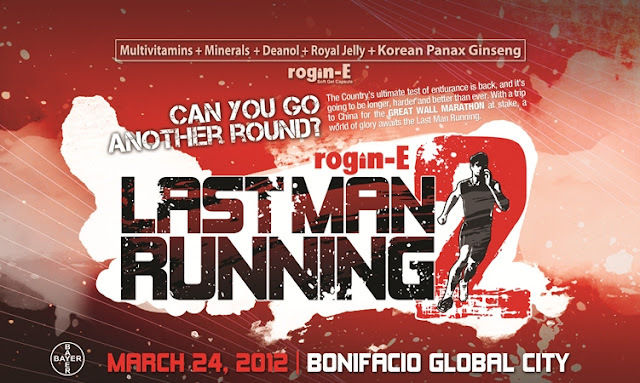 Can you go another round in Rogin-E's Last Man Running 2? 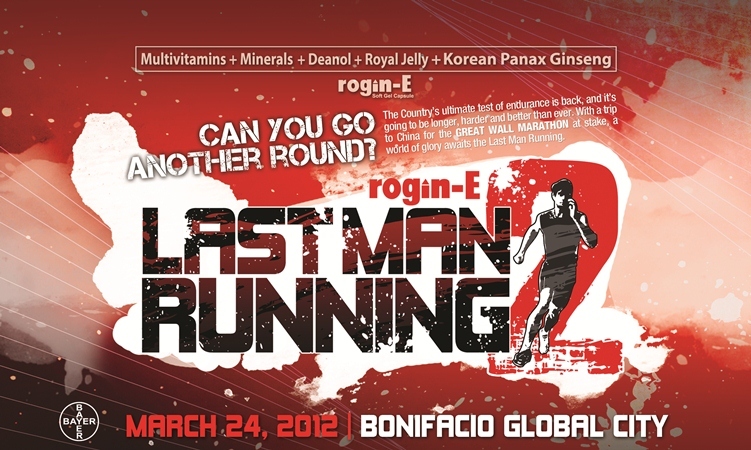 The country's ultimate test of endurance is back, and it's going to be longer, harder, and better... and it's happening on March 24, 2012 at the Bonifacio Global City in Taguig! This year's Last Man Running 2 takes running into the next level. 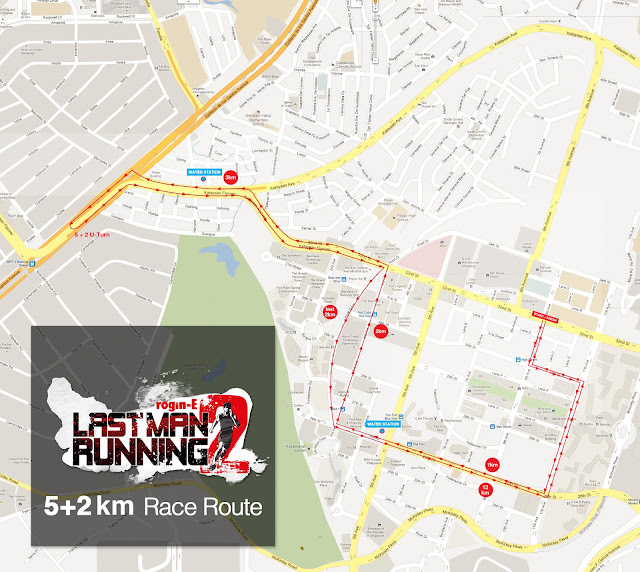 If other running events have the usual 5- and 10-kilometers run, Rogin-E makes it exciting by offering three categories -- 5+2K race, 10+4K race, and the centerpiece event is called the Last Man Running (LMR), a 7-hour marathon. You say, "Seven hours? That's impossible!" Well, that's why there's Rogin-E to the rescue. Each soft gel capsule of Bayer's Rogin-E has Multivitamins, Minerals, Deanol, Royal Jelly, and Korean Panax Ginseng, which surely helps provide endurance for a non-stop running action. These categories will have separate race courses, several convergent points with LMR, particularly near the finishing stretch. Furthermore, these two races will end at the finish arch. Runners can stop at the 5k/10k mark, but they can also take on the challenge of a further 2k or 4k. Rogin- E’s Last Man Running will be capped at about 7 hours. One lap is approximately 10km. Those who wish to register for LMR must submit (in addition to the other requirements) proof of participation in a full marathon (42.195km or longer) within 6 months prior to LMR, OR a medical certificate from a physician indicating participant’s fitness to participate in such a competition. Participants must check in 30 minutes before gun start. Those who fail to check in will be disqualified. All LMR participants will be given two race bibs with identical numbers. These must be pinned at the front and back of the runner’s singlet. One will be given during registration, and another one during the check-in. The male and female runners who sustain the nominated pace throughout the marathon and run the furthest distance will be declared as the "Last Man and Woman Running." In case there are no more runners during the 7th hour, the male and female runners who stopped running last will be declared as the LMR and LWR. Runners should sustain the nominated pace throughout the race to be qualified. There will be markers every 100m along the perimeter of the route to help runners determine the distance they’ve ran. All LMR participants will be handed colored strings for every hour they successfully complete. LMR runners must maintain the nominated pace per hour, as guided by the Rogin-E pacers. Runners who fail to maintain the minimum pace will be swept off the course by roving or stationed race marshals. At no time during the run are LMR runners allowed to stop, except for the following cases: lavatory break, to hyrdrate at hydration stations, to eat at carboloading stations, sponge bath, or to fix running gear. They MUST rejoin the RUNNING GROUP and maintain the current nominated pace. Any other reason for stopping will subject the LMR contender to disqualification. LMR Runners may withdraw from the race at any time during the 7-hour period. Upon withdrawal, all colored strings given during his/her participation in the run will be collected by the nearest race marshal. Likewise, all runners who were swept off by race marshals must surrender their strings. The organizers of LMR and its appointed race officials reserve the right to declare any LMR contender unfit to continue with the run upon recommendation of the race medical team. There will be water aid stations every 2kms. along the race route. Sports drink (if any) will be made available to runners every 5kms. along the race route. Carboloading stations, located 5kms. apart will open after the third hour of the race. Cold sponge stations will be available after the fifth hour. Portalets will be stationed along the race course. At exactly 7 hours after gun start, all race marshals will simultaneously blow their whistles to signal the end of the endurance race. All participants of LMR who are still in competition will be assisted right away by the most proximate race marshal. His/her race bib number and exact location (from the nearest distance marker) will then be recorded and subsequently submitted to the chief race judge to determine LMR and LWR winners. The Last Man Running will be awarded a trip to Beijing, China and entry to the Great Wall Marathon worth Php150,000. The Last Woman Running will receive a cash award of Php20,000. How to register? Log on to www.ROGINELMR.com or visit the different branches of Olympic Village in TriNoma, ATC, Robinsons Pioneer and Robinsons Ermita as well as ROX at Bonifacio High Street. How much? 5+2K Race is Php600, 10+4K Race is Php800, and LMR is Php1,200. What time? Gun start for LMR is at 2:00AM, 10+4K Race at 5:30AM, and 5+2K Race at 6:00AM. So have you thought about it? 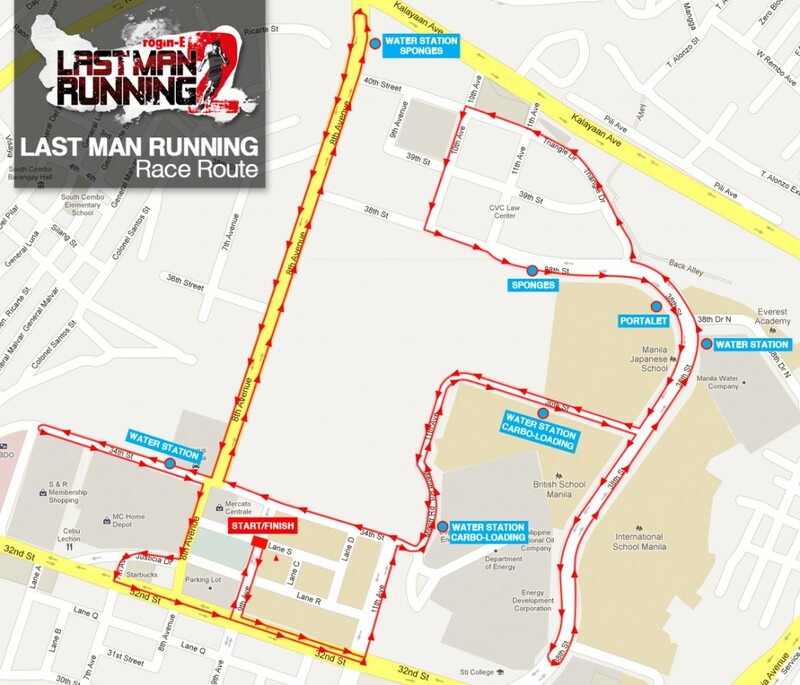 Do you dare to be the Last Man or Woman Running? This is going to be a tough run! Good luck!